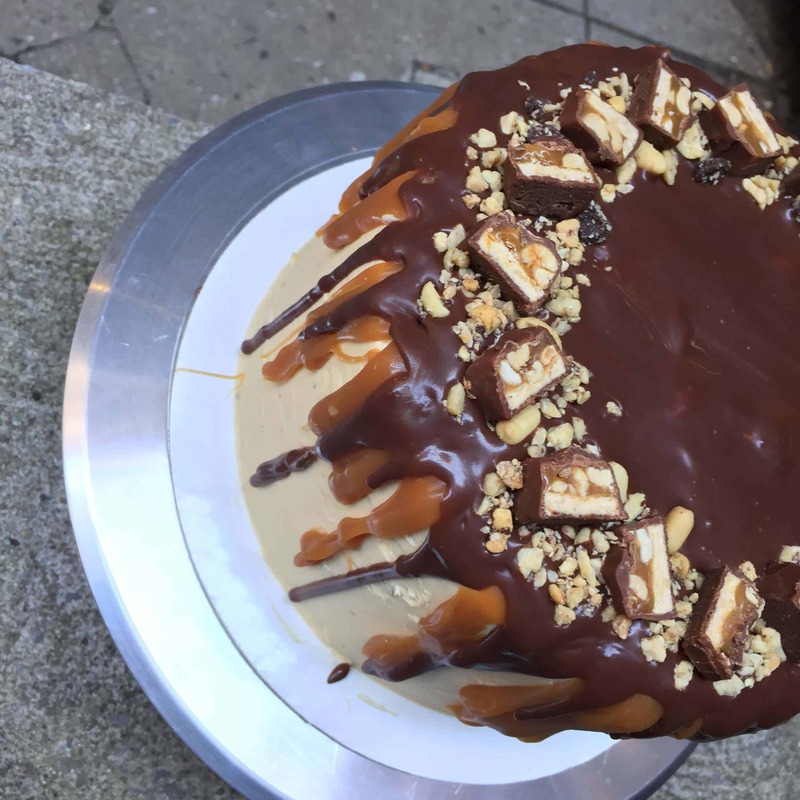 I’ve made various snickers cakes in the past, but this one really takes the cake (no pun intended). It uses an entire pot of caramel, and has a wonderful nougat filling speckled with peanuts and sea salt. Does it really get any better? Preheat oven to 350 degrees F. Grease three 9-inch round cake pans, and line/grease the bottoms with rounds of parchment paper. Begin by making the chocolate cake batter. In a very large bowl, add flour, sugar, cocoa, baking powder, baking soda, salt and espresso powder. Whisk through to combine. Add milk, vegetable oil, eggs, and vanilla to flour mixture and mix together until well combined. Carefully add hot water to the cake batter, and mix until all ingredients are fully incorporated. Distribute cake batter evenly between the three prepared cake pans. Bake for about 30 minutes, or until a toothpick or cake tester inserted in the center comes out clean. For the Nougat Filling, combine the butter, peanut butter, marshmallow fluff, vanilla, and heavy cream into the bowl of a stand mixer. Mix on a low speed until combined, then gently fold in the peanuts. For the salted caramel sauce, add the sugar in an even layer over the bottom of a heavy saucepan (with a capacity of at least 2 or 3 quarts). Heat the sugar over medium-high heat, whisking it as it begins to melt. You’ll see that the sugar will begin to form clumps, and that’s okay. Keep whisking and as it continues to cook, and they will melt back down. Stop whisking once all of the sugar has melted, and swirl the pan occasionally while the sugar cooks.Continue cooking until the sugar has reached a deep amber color. It should look almost a reddish-brown, and have a slight toasted aroma. This is the point where caramel can go from perfect to burnt in a matter of seconds, so keep a close eye. Add the butter all at once. Be careful, as the caramel will bubble up when the butter is added. Whisk the butter into the caramel until it is completely melted. Remove the pan from the heat and slowly pour the cream into the caramel. Again, be careful because the mixture will once again bubble up ferociously.Whisk until all of the cream has been incorporated and you have a smooth sauce. Add the fleur de sel and whisk to incorporate. Set the sauce aside to cool for 10 to 15 minutes and then pour into your favorite glass jar, and let cool to room temperature. (You can refrigerate any left over sauce for up to 2 weeks). While the cakes cool, make the frosting. Beat the butter on medium-high speed until fluffy. Pour in the salted caramel, and beat until combined. Reduce the speed to medium-low and slowly add the powdered sugar, a little at a time, until it has all been incorporated. Add the salt and vanilla. Increase the speed to medium-high and beat for an additional two to three minutes, until light and fluffy. Add cream as needed. For the cake assembly, place one cake layer on a serving plate. Cover with half of the nougat filling and then spread a couple spoonfuls of the salted caramel sauce over top to evenly cover the nougat filling. Sprinkle with sea salt and chopped peanuts. Repeat with remaining layers. Frost the cake with the salted caramel frosting, finishing it as smoothly as possible. Refrigerate the cake for at least 30 minutes, until the frosting is set. While the frosting sets, prepare the chocolate ganache. Place the chocolate in a medium bowl; set aside. Place the cream in a small saucepan over medium heat and warm until it just comes to a boil. Pour the cream over the chopped chocolate and let sit for 2 minutes. Begin whisking the mixture in the center, gradually working your way outward until the ganache is completely smooth. Set aside to cool, whisking occasionally, until it has thickened slightly, but is still a pourable consistency. If you want to make the exterior of your cake smoother, you can add an additional layer of frosting on top of the crumb coat. The garnish is the final step. 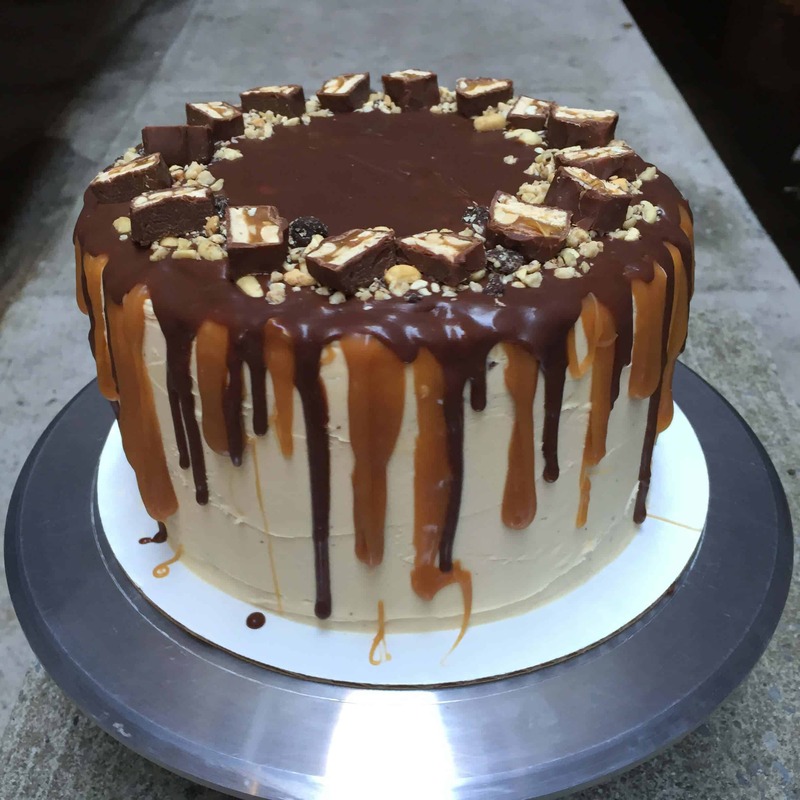 Drizzle caramel over the top and edges of the cake. Slowly pour the chocolate ganache into the center of the cake, letting it push itself outward, to the edge of the cake. Let some of the chocolate drizzle over the sides, on top of the caramel. Refrigerate the cake for 15 minutes, giving the ganache a chance to set up. Top with crushed peanuts, chocolate pieces, and place cut up snickers around the edge of the cake. You also sprinkle a little sea salt around the top, if desired. Mm, wow! I was looking for a snickers ice cream cake for my boyfriend this Friday and went to your home page by chance and saw this. This looks awesome! I think I’ll do half cake half brownie + ice cream. Mmmmmm! Yum, I’m planning on making some type of snickers ice cream cake for my boyfriend this Friday. I think I’ll do half cake batter half brownie with lots of ice cream on top! Hi! Just wondering if I could substitute the cream with something else for the salted caramel sauce? This sounds amazing!! not sure! I’ve only ever baked with heavy cream! Instructions are the same as in my youtube american buttercream tutorial! Hope that helps, happy baking! Hi. Do u have any tips when making the drip style decorating?. I tried but as i poured the chocolate ganache over the frosting it went hard straight away without giving it a chance to drip. & the caramel didn’t stop dripping. thanks! My salted caramel doesn’t taste quite right. I used regular sea salt because I had it on hand and didn’t know better. Is that the problem or did I do something wrong in the cooking process? depends on how it tastes! that could definitely influence the taste, but without knowing how it tasted off, I can’t offer much other advice!